The legendary birth place of King Arthur is being given a facelift. Tintagel Castle, in north Cornwall, will be given better roads and pavements in an effort to attract more visitors to the site. Work starts on Monday on the £2.5m scheme which will also bring improvements to the nearby town. Other work includes new street lights and placing overhead power and telephone cables underground. Street parking will be banned in the summer and a shoppers' car park will be provided. The overall aim is to revive the local economy by increasing the appeal and extending the season of this key tourism area. The town already attracts an estimated 27,000 visitors a year who spend about £5.5m on local products and services. 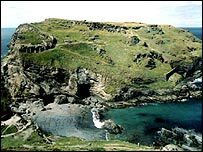 Tintagel's claim to being linked to King Arthur became more solid after an ancient stone bearing a 6th Century inscription similar to the name Arthur was unearthed at Tintagel Castle in 1998. The castle was already the mythical birthplace of the legendary king, and for some, the discovery proved King Arthur had his headquarters, the court of Camelot, at the site.